Kim Chiu and Xian Lim star in their very first tandem in the big screen! Yes, the well-loved love team dubbed as KimXi finally lead in the upcoming Star Cinema movie titled, "Bakit Hindi Ka Crush ng Crush Mo?" As the movie poster suggested, the film is another romance-comedy flick! It depicts a popular Koreanovela. And look, Kim transforms into a weird look! Under the direction of Bb. 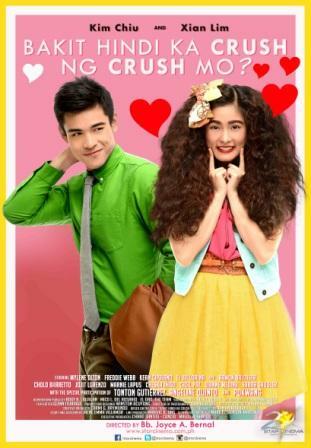 Joyce Bernal, "Bakit Hindi Ka Crush ng Crush" is set to hit the theaters this coming July 31, 2013. On our next posts, watch out for the teasers and full trailer of this another exciting film to be published here in this site!